When buying an airplane ticket to India a few months ago, I had a difficult decision to make: should I pay $200 less and endure an 8-hour layover at the Doha airport on my return? Normally, it wouldn’t be worth it. But I was tempted by the location of my layover, and the idea of getting out of the airport and exploring a new country during that time. After all, Qatar isn’t a place I frequent regularly, nor one I anticipate visiting anytime soon. I conducted some preliminary research on possibilities. Would I even be able to leave the airport? I learned that visitors could buy a visa at the airport upon arrival and it seemed that the city center wasn’t too far. So in the name of “saving money,” I took the ticket with a long layover, even though I knew I might end up spending what I saved on financing my little adventure. A few days before leaving for India, I searched some more, and I made a plan. I would buy a visa upon my early morning arrival, take a taxi to the city center, get breakfast somewhere (hopefully along the coast), take the Doha hop on/hop off bus around the city, and then get a taxi back to the airport. I started to add up the costs and realized that the expense was getting more extravagant than I had anticipated. And yet since I was carrying my violin and laptop, I knew I wouldn’t want to roam the city on foot for hours. So the day before leaving India for my return flight, I decided to google “Doha city tours” just to see if I might come up with a better option. The result was an unexpected surprise: Qatar Airways offers Free City Tours to Transit Passengers. It looked too good to be true. And why didn’t I see it earlier? Aha – the article was published just last week, when I was already on my way to India. I found the press release on the website of Qatar Airlines but there wasn’t a whole lot of information there. What time were the tours? Would I still have to buy a visa? Was it really free? I figured that it was worth a try. This service appeared to be new, and it seemed official enough. I was pleasantly surprised on all accounts. I arrived in Doha at 6:30am and quickly found the “Qatar Airways Doha City Tours” counter. They took my passport and boarding pass, registered my information and told me to be back at 7am for a 7:15 departure. Just enough time to use the restroom and get a little cash out of an ATM. There were only eight of us taking the tour on this cool morning and we were shuttled to the arrivals terminal and given a card to present at immigration. There our passports were stamped with a 24-hour visa and we paid nothing. Then we were escorted out to a comfy mini-bus where we had more than enough room to spread out. We were told we could leave our carry-on items on the bus whenever we stopped; they would be looked after. An English-speaking guide led us through the city on a nearly 3-hour tour, and in the end we took the same route as the hop on/hop off bus that would have cost me $50 for a one-day pass. We stopped many times along the route to take pictures and walk around. The brisk morning air and opportunity to walk without carrying my luggage helped to combat the fatigue I was feeling from losing a night of sleep. They even provided us with cold bottles of water. Extra points, Qatar Airways! Doha was impressive. Most of the city has been built in the last couple of decades and the architecture is fascinating. It’s the most modern Arabic country I’ve seen. At the end of the tour, we had 25 minutes to explore the souk (market), which I found to be very chic compared to what I have seen elsewhere. Also more expensive. The dress is different here, too, with men wearing a white thobe (a long white gown) and the women in all black, sporting a shayla (headdress) and abayha (long dress). The coast was especially beautiful, and when I saw people out running it made me feel nostalgic for the Chicago lakefront. Our tour guide also told us that 75 percent of the population in Qatar is made up of ex-pats that have come to work, and only 25 percent is women. He also told me that these special transit tours have only been operating for a month, and that sometimes no one shows up. However, even if only one person signs up they will run the tour. The most they have had so far is 22 people at a time. They are hoping that it generates more interest. Other passengers told me that they had discovered the tour by chance, as they wandered the airport trying to kill time. I think that Qatar airlines needs to increase their publicity for this service, both on their website and in-flight. Maybe that’s coming. The press release was already a good move, but not everyone researches things like I do. So, hats off to Qatar Airlines. 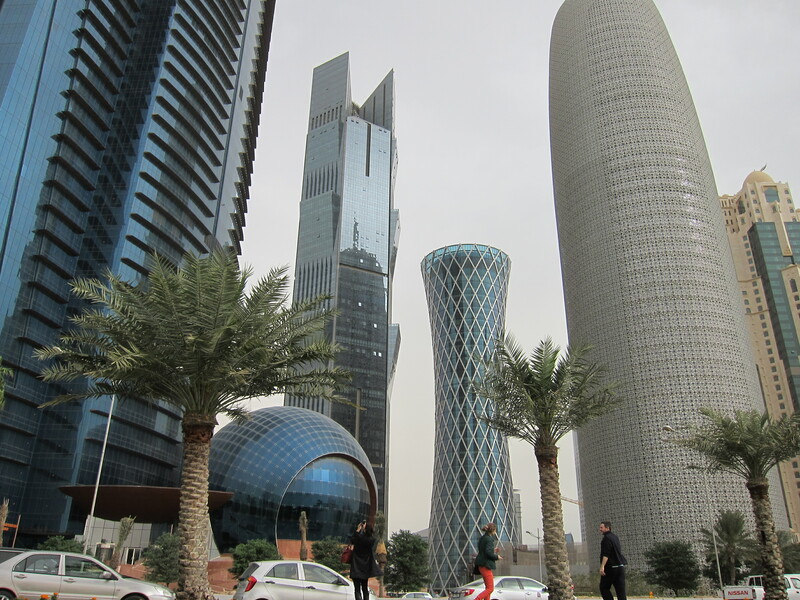 This tour was perfectly planned for transit passengers with a 5-12 hour layover at the Doha airport. The convenience and ease that they offered would have totally been worth a fee of $50 or more. I felt like a VIP customer when in reality the free tour was available to me because I opted for the ticket that saved me $200. After the tour, I was happy to settle down for two more hours at a coffee shop where I took advantage of the airport’s free Wifi. If you ever have the opportunity, don’t miss this experience! Thank you Qatar Airways! This entry was posted in Countries Visited, Travel and tagged Doha, Doha City Tours, Qatar, Qatar Airways, travel. 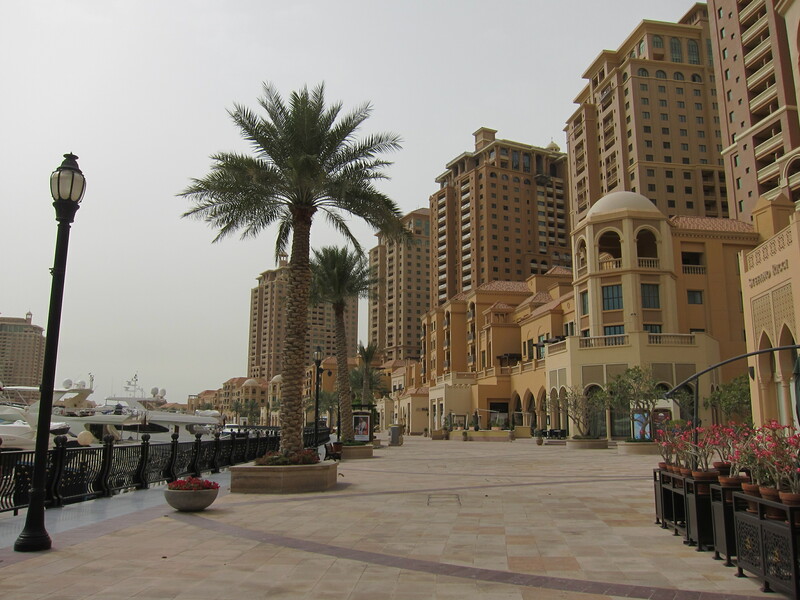 Thanks , for ur detailed experience about the tour, we also have 8 hr stopover at Doha, will definitely try this service…. Good recap of the tour, thanks. I’ve never been to the Middle East but might have a transfer in Doha for an upcoming trip. Very good to know. Thanks a lot to share your experience in details. It’ll help me a lot because I’ve a 12 hours layover at Doha. What else I can do after this 3 hour tour can you please advice? Thanks for this! Hoping to be doing the same later this year, and now definitely looking forward to it! Thanks for this detailed narrative! I’m in the exactly same situation, currently going through stanza four, where I’ve purchased my ticket to India and struggling to find information on the tour, whether visas are needed etc. I’d like to inquire, do you hold an Indian passport or American one? The website lists 33 nationalities that are eligible for visa-on-arrival but I’m not sure if this special category of visa for only-doha-city-tour also falls under it. So I’m trying to understand if I should apply for transit visa from before. thank you for this valuable info.i too hav a 12 hr layover in doha and was deciding on the hop on hop off tour.however,now im going to join the free city tour. Thanx for the info.